Japan’s top government spokesman said yesterday there is no difference in views between the government and the Bank of Japan over the weak yen. “There is no difference at all,” Chief Cabinet Secretary Yoshihide Suga told a news conference, clarifying remarks he made on Tuesday. He said his earlier remarks were to simply state that a weak yen has not boosted exports as the government had expected. Suga also said corporations are still watching the development of the global economy including a soft yen. He made comments after BOJ Governor Haruhiko Kuroda said on Tuesday that a weak yen, as a whole, has a positive effect on Japan’s economy if the currency’s move reflects economic and market fundamentals. 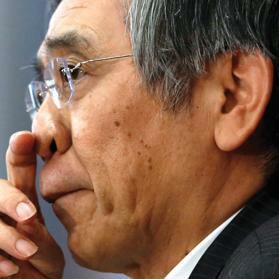 He also said recent falls in yen has not caused any big problem for the economy. Prime Minister Shinzo Abe and his Cabinet ministers have recently started to comment on the disadvantages of the weak yen, not only the positive impact, largely on the need as politicians to pay heed to their local constituencies. Abe has pushed his massive monetary stimulus, fiscal spending and structural reforms, dubbed three arrows of “Abenomics”, which helped boost business confidence by weakening yen and lifting share prices. But some lawmakers criticise the Prime Minister’s policy as hurting households and small firms through rising imports costs via a weak yen.